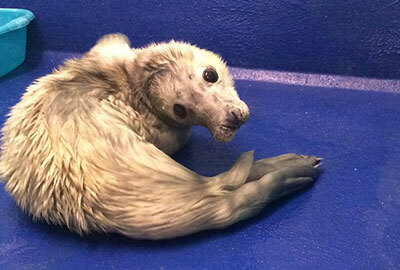 Wham, first whitecoat of 2018/19 season seal pup, was rescued on 7th September 2018 from Zennor beach by members of the British Divers Marine Life Rescue (BDMLR) Medics and relayed to Gweek. This 2-3 days old male seal pup was separated from mum, malnourished and very weak, upper respiratory infection, high temperature, minor ulceration in his both eyes, superficial grazes to flippers and chin. 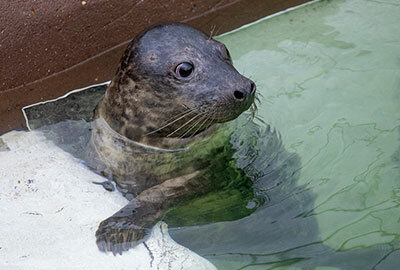 Update - 28th October 2018 : Wham is now in the outside nursery pool 1 for his next stage of rehabilitation. He currently weighs 20kgs. Wham´s flipper tag ID number is 301 (red). Click here to see a larger version of this photo which was taken on 26th October 2018. Update - 25th November 2018 : Wham is in the convalescent pool for his final stage of rehabilitation and putting on weight. He currently weighs 23kgs. Click here to see a larger version of this photo which was taken on 23rd November 2018. 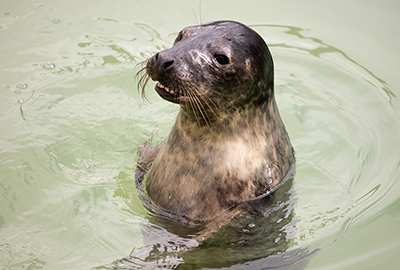 Update - 1st January 2019 : Wham was returned to the wild on 27th December 2018 at Porthtowan beach along with other rescued seal pups, Terminator, Blondie, David Bowie, Care Bears and Polurrian.